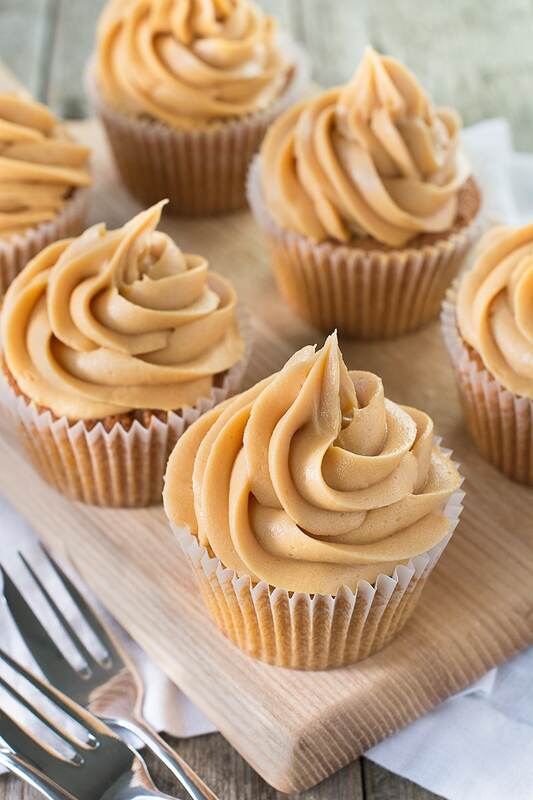 Perfect topped with caramel buttercream. 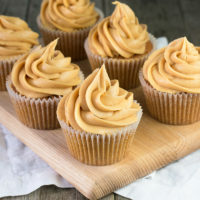 A few days ago I shared my recipe for caramel buttercream (which you seemed to love 🙂 ), and what better to go with caramel buttercream than a delicious caramel cupcake. 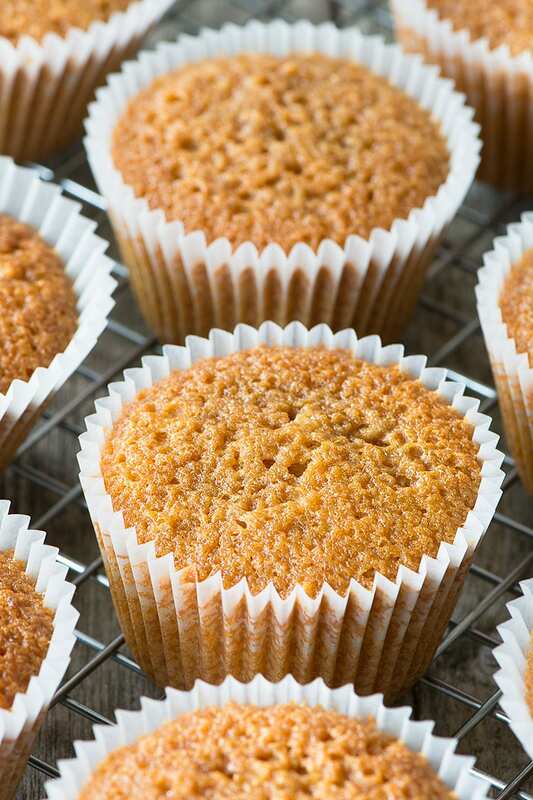 As with all of my basic cupcake recipes I’ve tried to keep them as easy to make as it humanly possible (stick it in a bowl and mix it up – it really is as simple as that) and also to make sure that the caramel flavour really comes through. I should actually call them double caramel cupcakes as I’ve sneaked the flavour in twice, once by using light brown sugar rather than caster sugar (which seems to be the popular way of making caramel cupcakes from what I’ve seen) and then really pushing the caramel favour by mixing lots of caramel sauce into the mix too. I designed these to go with the caramel buttercream, but they’d actually go brilliantly with other flavours such as chocolate or vanilla too. The reason I like to post my cupcakes as the cake and buttercream separately is that it makes it easy to find the bits to be able to mix and match between the two to create whatever combination you want. I’m in the process of putting together a mix and match cupcake index to keep all the recipes together in one place (as well as some yummy fillings too) so keep an eye out for it over the next few weeks. 165 g soft light brown sugar - you could use dark brown sugar or light muscovado sugar if that’s what you happen to have in your cupboard. 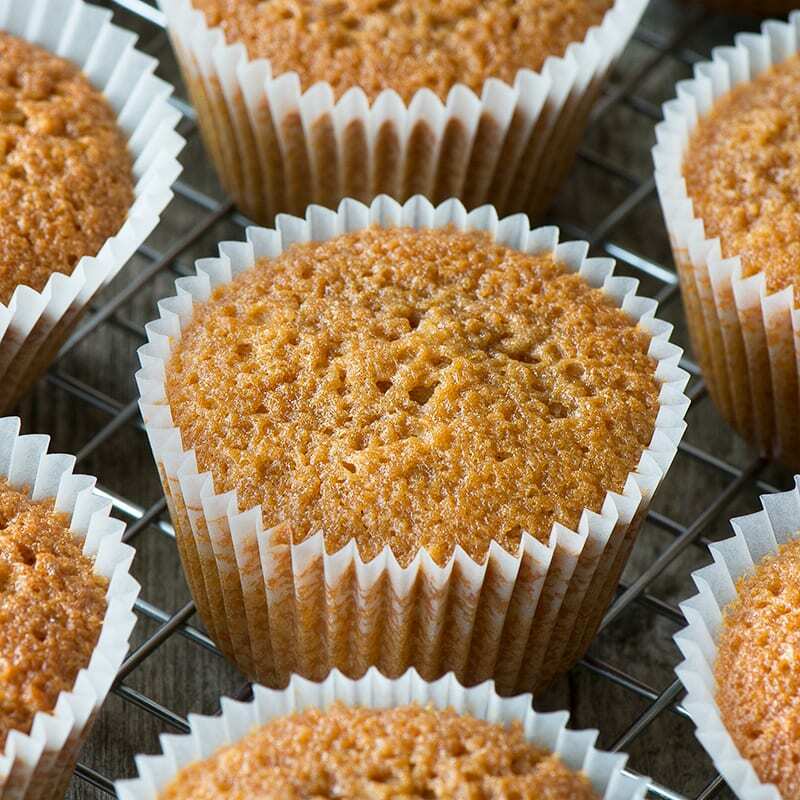 Place your cupcakes cases into a muffin tin. Put all of the ingredients into a large bowl (165g self-raising flour, 165g soft margarine, 3 large eggs, 165g soft light brown sugar, ¼ tsp vanilla extract, 150g caramel sauce) and mix until fully combined (you can do this by hand or using an electric mixer on a low speed). Evenly distribute the cake mixture into the 12 cupcake cases. Cook for 18-20 minutes until a skewer inserted into the middle comes out clean. These caramel cupcakes are perfect topped with caramel buttercream or if you fancy trying something different then you can find all of my icing flavours in my cupcake index. I’m sharing this recipe with the following blog challenges… #TreatPetite with CakeyBoi and The Baking Explorer and #CookBlogShare with Hijacked by Twins. Can I ask – how do you get your cupcakes to be flat? Mine always rise up in the middle! It that using this recipe? If it is then I’m not too sure why yours would be different to mine. Did you use a homemade caramel sauce or a ready-made one? Did you use a fan or non-fan oven? Hi ,I love ur recipes but m vegetarian so what can use as a substitute for eggs n if I use it then the proportion of other ingredients change? Sadly there’s not a simple substitution for eggs (take a look at my vegan vanilla cupcakes to read a bit more about egg substitutions). However, it’s something I can look into working on in the coming year. I have made this recipe twice and both times when I put them in the oven they rise up then fall completely flat with a large dip in the middle. Maybe I’m doing something wrong but they haven’t worked either time. Hi Simone, what caramel sauce did you use in the recipe, was it homemade or a shop bought one? Hello Charlotte – Just wanted to say thanks for the recipe, the cakes turned out perfectly and taste real nice. I love your site. Can I use this recipe for a cake ? and if yes which tin size can I use? I haven’t tried it but it should work. This about of mixture would be for a 18cm round tin. If you’re using sandwich tins then it’ll take 30-35 minutes to bake. If you’re using one deeper tin the it’ll be around 45-50 minutes. Does it work if I cover the with fondant or marzipan ? I mean is it very soft and will crumble or will hold its shape as a cake. I’ve not tried it, but it should work. Thank you for the recipe, so quick and easy and came out amazingly. Will definitely be trying some more of your recipes. I’m planning to make them again next week for bonfire night, little caramel bonfires. Yummy.